A lot of people think of the Twelve Days of Christmas as just some weird little ditty we're used to singing this time of year -- who knows why. I mean, what do calling birds and maids a-milking have to do with the "little lord Jesus" anyway? But Christmas -- though we've gotten away from the practice -- is actually a 12 day feast extending from December 25th to Epiphany on January 6th, when the Wise Men are supposed to have arrived with their famous gifts. 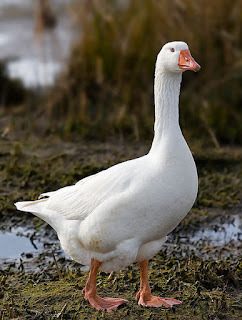 Today, as it happens, is the 6th Day of Christmas, the one with the "geese a-laying" according to the song. However the lords, pipers and french hens aren't from some song writer's psychedelic dream or or an obscure, orgiastic revel of the middle ages. Carols.org, a British site dedicated to Christmas music, says that all odd things that happen in that song are actually secret code for religious truths. There was a whole symbolic vocabulary in olden times that turned up in songs and paintings frequently. 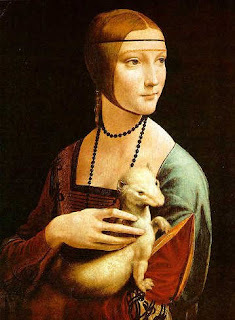 If you ever go to the art museum and see a renaissance painting of a woman holding a white ermine (like the one by Da Vinci to the right) it's not that ferrets were popular pets back then. A white ermine was code for sexual purity. Really... and I don't care to speculate on why. So here, decoded for your benefit, is the mysterious, esoteric meaning of The Twelve Days of Christmas (courtesy of carols.org). 5. Golden Rings refers to the first Five Books of the Old Testament, the "Pentateuch", which gives the history of man's fall from grace. Now you know... the rest of the story!